Traditional Japanese confections, or wagashi, are beautiful to look at, texturally complex, and subtly flavored. They are often made with ingredients Americans are surprised to see in a dessert. Rice is used to make mochi, azuki beans are the basis of the red bean paste filling in many sweets, and red algae is processed into kanten, or agar-agar, and used to make fruity gel treats that are similar to Jell-o molds, but much lovelier. Most Americans probably don’t realize that marine plants are commonly used in processed foods—they have great stabilizing properties. If you read the ingredient labels for some ice creams, beverages, or sauces, for instance, you might see carrageenan, which is made from seaweed, or algin, an algae-based product, listed. Agar-agar, a similar substance made from red algae, is available to home cooks and deserves to be more popular. It’s vegan and kosher and contains fewer calories than animal-based gelatin, and it’s just as easy to use. It’s also high in fiber and helps you feel full. (It’s the main ingredient in a fad diet in Asia and has received some press in the U.S. as an antidote to obesity.) Plus, it’s a good source of iron, phosphorus, calcium, and vitamins A, B1, B6, C, and D. It comes in powder form or as flakes and is found in health-food stores, Japanese specialty shops, and the health-food or Asian sections of good grocery stores. 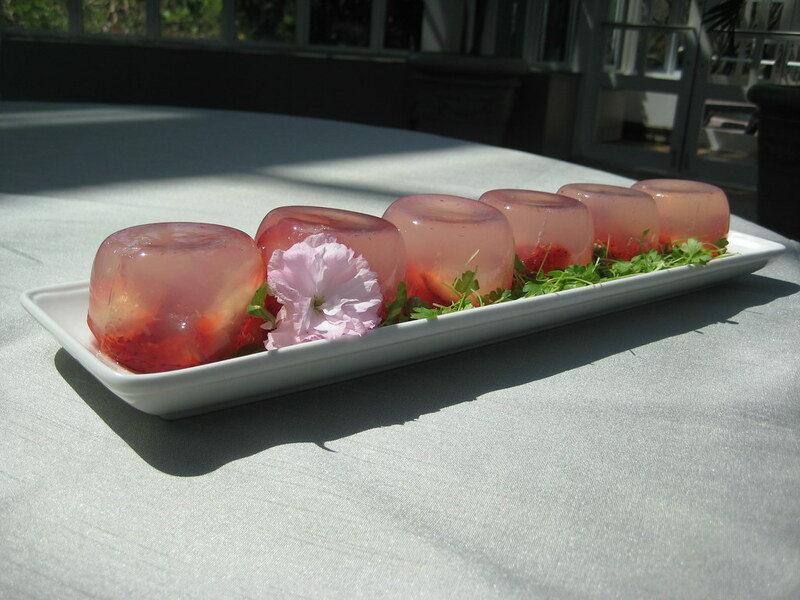 Use agar-agar to make this refreshing dessert with strawberries or any other fruit. Traditionally, anmitsu, a variation in which the kanten is cut into cubes, is topped with a molasses-like syrup called kuromitsu. I think a dark caramel sauce would be a nice substitute, but you could also just garnish it with mint or serve it without any accompaniment at all. Give this delicate, delicious Japanese dessert a try to celebrate cherry blossom season and the slow but steady arrival of spring! Clean and slice the strawberries. Add the agar-agar flakes to a small pan containing the 2 cups of water. Bring to a boil over medium-high heat, stirring constantly to keep the flakes from settling to the bottom. Reduce the heat to a simmer and stir for 2 minutes. After the agar-agar has dissolved, add the sugar and continue simmering until the sugar has blended completely. Remove the mixture from the heat and transfer to a heat-proof container that is easy to pour from. Prepare 8 small molds (bowls, ramekins, teacups, or other small containers with nicely shaped bottoms) by wetting the inside with water to prevent sticking. Pour 1 tablespoon of warm kanten mixture into each. After it has begun to solidify (about 10 minutes), add some fruit. Try to avoid letting the fruit touch the sides. Add another tablespoon of kanten, then the rest of the fruit. Top off with the remaining kanten mixture. Let the kanten cool at room temperature until relatively firm, then chill in the refrigerator until it sets (about an hour). When serving, use a toothpick or sharp skewer to separate the top rim of the jelly from the mold, then turn out onto a serving plate; it should pull away cleanly once you get it started. You can make this recipe a lot healthier if you omit the 3/4 cup of sugar and use fruit juice instead of water. Use 3 cups juice, 4 tablespoons agar-agar, and any fruit pieces you like. What a lovely article. I do believe it would be helpful to mention some approximate amount of strawberries (or other fruit) in the ingredients. People often shop or prepare from a list like that. Kanten, or agar-agar, is the basis for for many Japanese sweets, including this tasty treat. Photo by Sarah Schmidt.